The New York Jets are an HBO ratings monster, after being featured each week on the networks presentation of “Hard Knocks”. But along with entertaining the masses, the sound bite laden Rex Ryan still went about official league business, which included trimming his team’s roster by Sunday. One unexpected roster casualty is Chauncey Washington, who performed well throughout camp and appeared to increase his worth with performances against the Panthers and Eagles in exhibition games. In contrast, Jets fourth-round pick, Joe McKnight, has been disappointing at best. From poor conditioning to an array of mental errors that brought a tongue lashing from his head coach, it would have been no surprise to see McKnight’s name scattered among others on the cutting room floor. It’s not, as Washington absorbed the full impact of the falling axe. 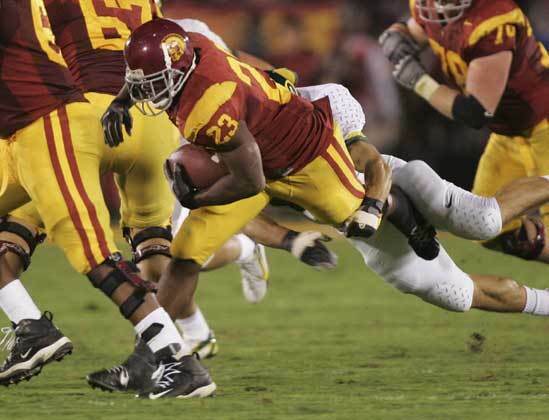 Washington and McKnight were backfield teammates at USC, where they also played with Jets quarterback Mark Sanchez. With a crowded backfield that features Shonn Greene and Ladainian Tomlinson, a disappointed Washington is likely headed to the practice squad, but the vacated roster spot was used to add another of Sanchez’ college targets. The Jets claimed Patrick Turner off waivers from Miami, reuniting the receiver with Mark Sanchez. Turner was slow to develop in the Dolphins system, as he was at USC, but will have another opportunity in the Big Apple. He was selected by Bill Parcells in the third-round of the 2009 draft. Broncos running back Lendale White will miss the 2010 season with a torn Achilles tendon. White was facing a four game suspension for violating the league substance abuse policy, and was traded from the Titans to the Seahawks, before being picked up by Denver after he was released by former coach Pete Carroll. Mike Williams’ comeback is legit, and his roster spot is not a charitable donation made by a former coach to one of his favorite college players, as so many seemed to believe. Big Mike has proven through exhibition that he belongs in the league, and with the Seahawks releasing T.J. Houshmandzadeh, the organization has indicated that they are confident that he gives them more of an opportunity to win games. As expected, Matt Leinart was released by the Cardinals on Saturday. Now the focus is on Seattle, as we wait to see if Carroll has any interest. With the Seahawks trading for Charlie Whitehurst and extending his contract, it isn’t very likely that they will be accepting of Leinart’s salary for use as a third-string QB. The Ravens also released Troy Smith on Saturday, leaving two Heisman winning quarterbacks looking for NFL homes. Drew Radovich was waived by the Minnesota Vikings. The offensive lineman is mostly remembered for moving in and out of Pete Caroll’s doghouse for untimely false starts and holding penalties. ~ by Anthony on September 5, 2010.